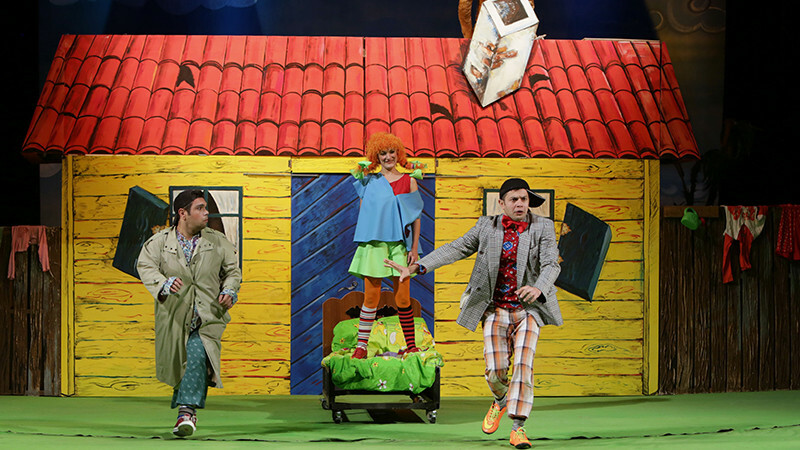 Pippi Longstocking in Azerbaijan State Youth Theatre of Young Spectators buy tickets online. Delivery of tickets for the event Pippi Longstocking. Pippi has no mother and her father is in the sea. She is left alone. In the meantime, his closest friend is a monkey and a horse. Nevertheless, she finds new friends for herself. However, mother and other surroundings of these friends consider Pippi’s independence andunusual behavior abnormal. The social security department is trying to send her to the orphanage. At the last moment, her father comes and rescues his daughter from those who do not accepther. Many such opinions as to stand up for the poor, help the helpless, to be patriotic and humanist, and thoughts aboutfamily upbringing are uttered during the performance. This spectacle is of great educational significance for young audiences, with an eye-catching acting, beautiful decor, and some other good features.